One of the more glorious moments of our day was the wedding ceremony. Our longtime friend and pastor gave a beautiful sermon of our love and relationship. 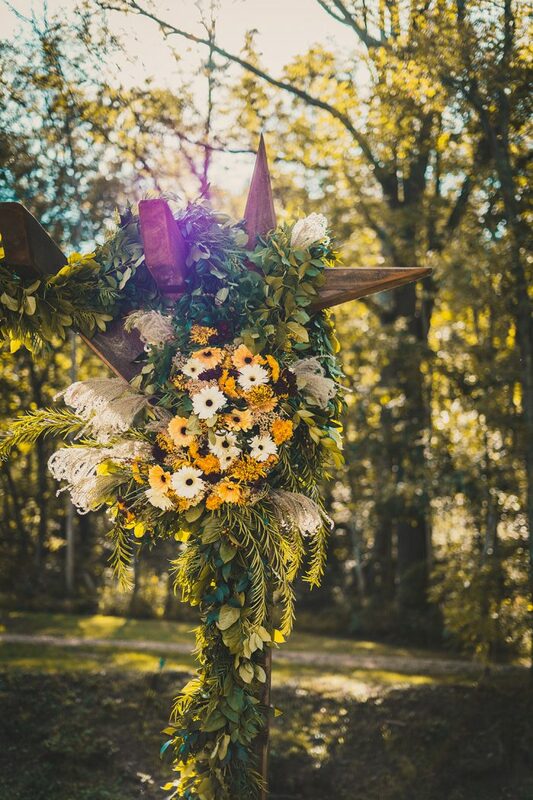 We stood under a wooden arbor covered in luscious fall florals – the arrangement was simply amazing! 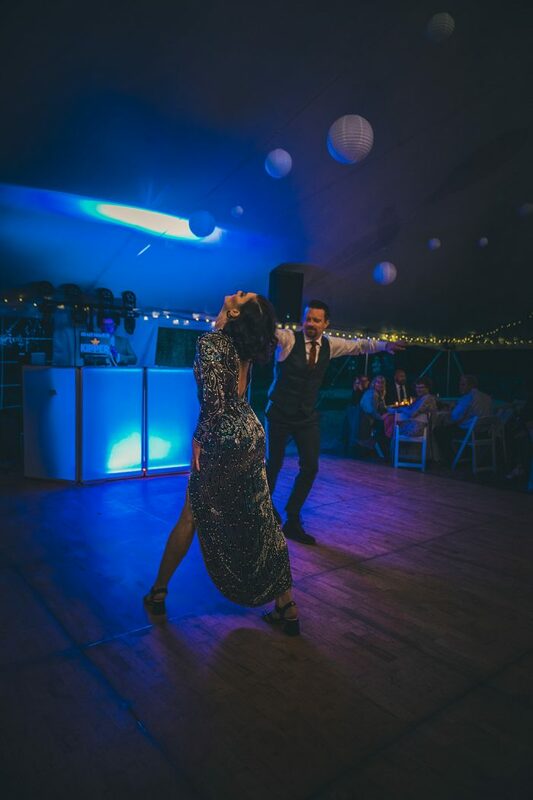 My husband and I were very determined to have an amazing dance party – which we did. Our DJ, Kipper did the best job I have ever seen at a wedding. It seriously made the whole day. My husband and I did a choreographed dance as our first dance, to Mi Gente. It was so hype! No one expected it, and we pulled it off pretty well. We are both big on dancing. My mother got married when she was 18, and had little to no say about her wedding day. She wanted to have a chocolate wedding cake, and her mother told her no. So to make up for lost time, I had the most chocolate-covered cake imaginable on a special table just for her as a surprise (with sign explaining the deal). She freaking loved it. And to my surprise, everyone else really did too! They thought that was so charming! The comments we got from our friends and family were that our day was just “so us”. 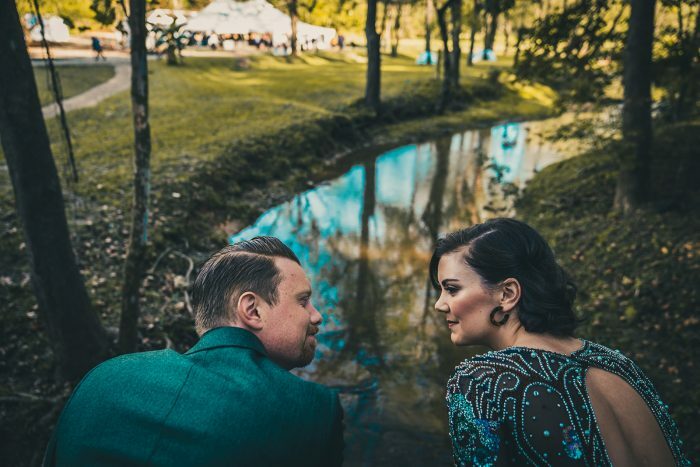 Our wedding venue was a farm with 10 restored vintage Airstreams on-site. Very retro, very unique. The entire grounds were beautiful! We adorned the reception with vintage plates and decor. 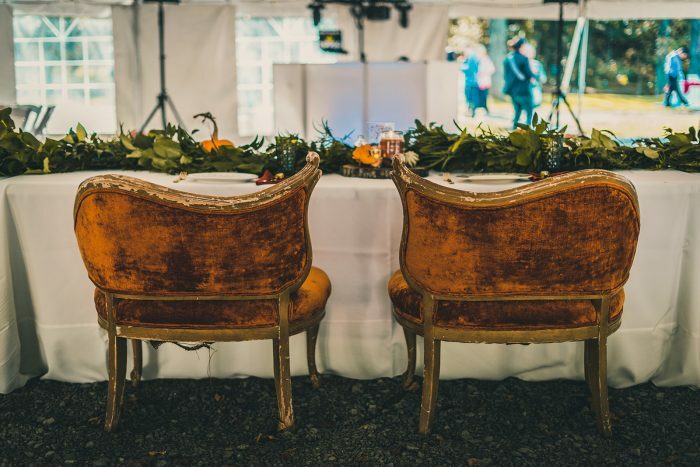 Our bride and groom chairs were antique orange velvet – to die for. We took a sort of “mini-moon” and stayed in Asheville for 3 extra days. We rented this great tiny house there, so fun! I am a big planner, so naturally I loved all of it. It was most fun to choose the decor for me, what’s really neat is to see your vision come together. My husband and I are very light-hearted and adventurous people. The fun has only just begun! We plan to take a more legitimate honeymoon abroad, sometime next year. We would love also to get a dog. 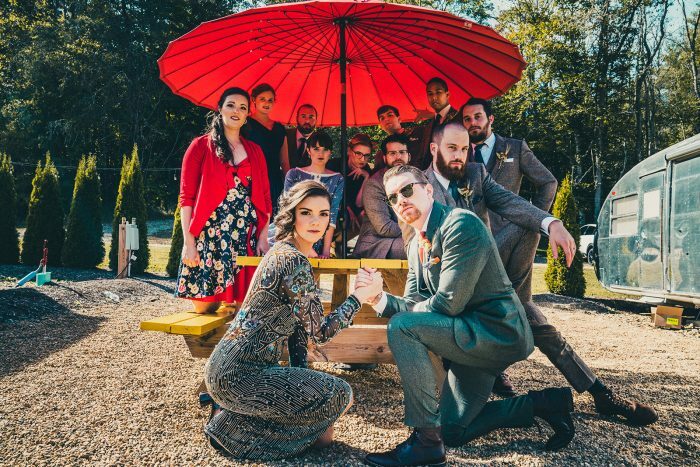 Our wedding crew was amazing, they are a really fun and easy-going group of people. So we had a lot of fun with these shots, and didn’t take things too seriously (as you can see). 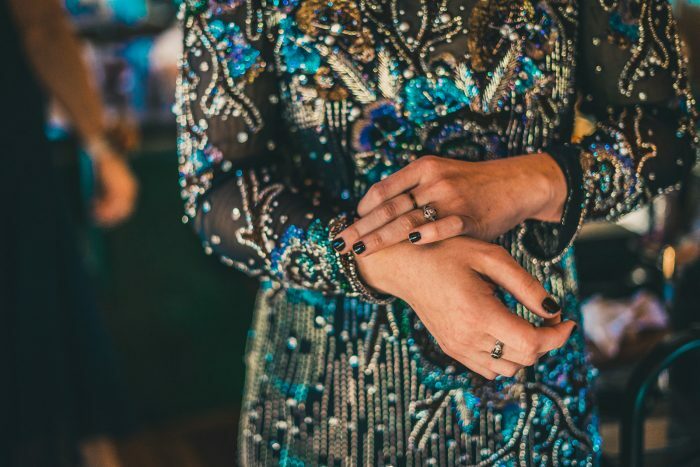 I did not choose a traditional wedding dress – which was the most fun thing ever. I highly recommend adding some color to your day! Because people did not expect it at all, they loved the uniqueness. I entered the wedding ceremony coming across a bridge in the distance – people didn’t even know it was me entering for a few seconds, because they were looking for white! My favorite choice of the day, color is always an option. 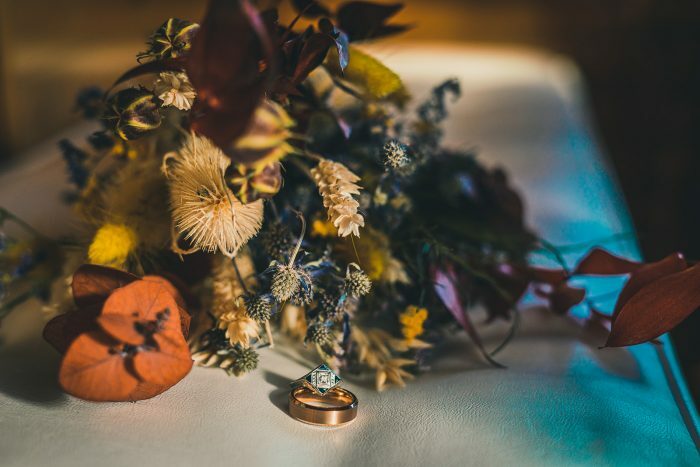 Our wedding rings next to the bridal bouquet. My wedding rings is an early 1900s silver and sapphire. Jacob chose a rose gold, very nice. The kiss! Our wedding ceremony was short and sweet, we did not write our own vows. 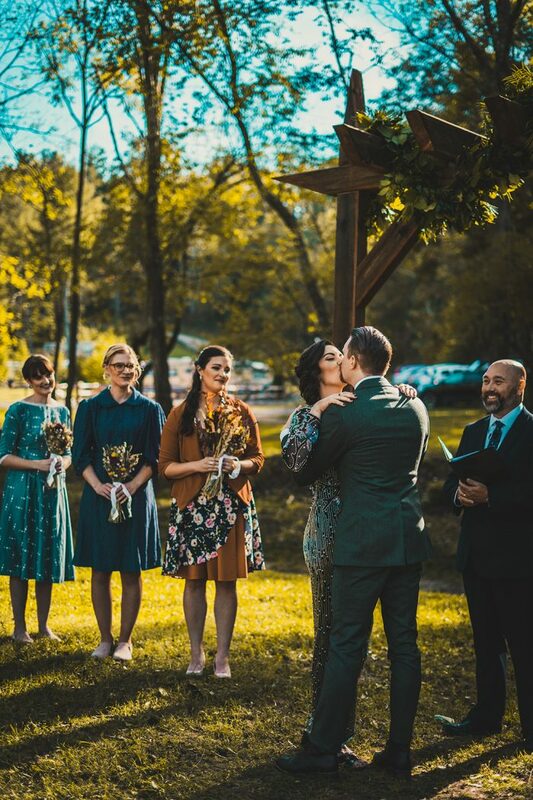 My bridesmaids all rocked different vintage dresses, while the groomsmen wore a great brown wool suit. Our wedding flowers were INSANE. This was the arrangement from our ceremony arbor. We did not incorporate a lot of floral in the reception decor, so having this was super special. What we did incorporate were several garlands of greenery along the dining tables. This is a very good “bang for your buck” item if you’re wanting to save on flowers. Dancing! And eating! And drinking! A late-night pretzel bar! So many good things. We had donuts instead of cake, which the groom and I never even saw. Too busy dancing I guess! I couldn’t possibly choose one moment of the day that was best, they were all magical. Truly – we got exactly what we were hoping for and more. So blessed! But something cool, we sat in these amazing chairs at our reception and felt like movie stars. Being a lover of all things vintage, I was psyched to sit next to my new husband in orange velvet. 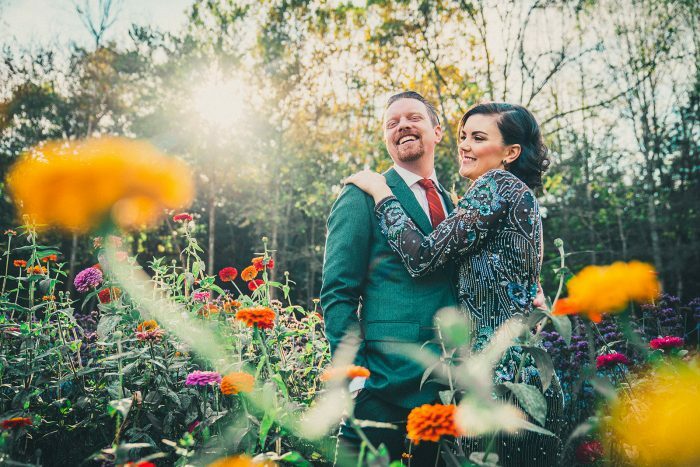 There was an amazing field of colorful flowers off the ceremony site, which made for incredible photos. This guy helped me into the center of the field, our first challenge as married folk.